Last week I spent three days on a Leadership Foundation for HE course on management, specifically aimed at Library and IT people working as middle management for the first time. I’ve always enjoyed management training (it formed a rich part of both my previous degrees), and welcomed the opportunity to go on this. I must say especial thanks to the Staff Development Office for funding my attendance too. One thing I’ll be up-front about were the rules of the room – anything we discussed in-depth with real world implications had to stay in the room. It made for a very free and frank exchange of experiences, but it’s a bit of a shame as I would love to tell people more about them. But those where the rules, and far be it from me to breach them. What I really learned was that a lot of people in positions similar to mine face a lot of the same challenges – and with the delegates taken entirely from HE we had a lot in common to start with, even based as we were around the UK. Quite a bit of what we covered wasn’t new to me, although much of it was well worth going through again. Some aspects and topics were on the other hand quite new – Edward de Bono’s colour of hats for thinking/decision making is one that really resonated with me. The three days started with the personal, taking stock of ourselves and our skills using a Myers/Briggs test – which for most of us revealed what we already knew. However, being aware of it allowed us to shift roles within the group exercises to make maximum advantage of our proclivities and talents. From team roles and effective communication we shifted to people management and motivation on the second day. Then leading, delegation along with problem solving. The last day looked at managing yourself and real world issues and examples. Throughout this was a very hands on, kinesthetic course with exercises, management games, discussions and tasks. Very much my prefered way of working, although I’m still quite tired out by it all some days later. it was just that full on an experience. Certainly the 24 people on the course bonded quickly in the face of this shared adversity, and discussions over drinks and food continued long into the night. Of especial worth of mentioning were the two extensive business management exercises. The first looked at setting up a Dot.com buisiness from concept to pitch. As the team (and possibly the room’s) biggest extrovert communicator I can honestly say my role as Executive Head of marketing was a plum role; indeed one of the other teams started bidding for my services. 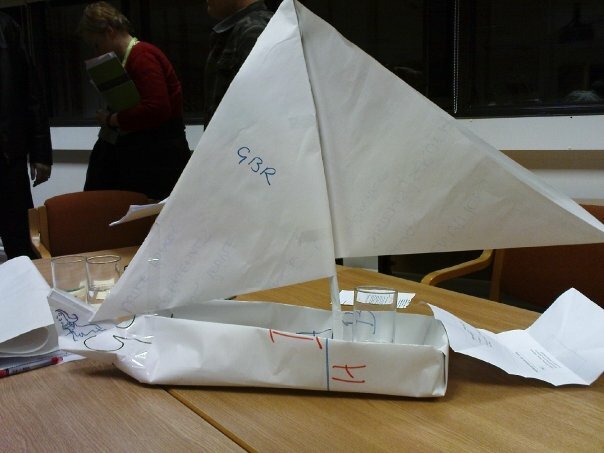 The other exercise saw me heading a team, with very limited resources, in construction of a ship – to be judged against predefined characteristics. While we didn’t win, our team worked effectively and efficiently – and at least we produced by far the best looking boat. There may be an underlying metaphor there – but I’ll skip on. If there was a low point for me it would be the talk from the real head of service. Contrasted with the interactivity and engagement of the rest of the course it felt dry, and I can;t say I took away anything of especial value from it. Not helped by the fellow legging it as soon as he finished talking, a debate and discussion about translating theory to practice at senior level would have been a wonderful capstone. But I have come back with a lot to think about, and the feeling that I’m not alone in the daily challenges I face (from the minor to the not quite so). I’d love to take some of the ideas further, and will certainly be following up some of the suggested reading to broaden my understanding of the concepts and techniques covered. As I’ve mentioned earlier from the 1st of October I’ll be switching jobs to managing the repository and the document supply teams (or as they will be then the Document Supply & Repository Team, aka DS&RT). While this date is a few months off, I’m already increasingly getting myself involved with the team and offering them what support I can. It is of course a big learning experience for myself, having never worked directly with inter-lending before. So as a result of this, and being a very much activist learner, I’ve spent the morning shadowing one of the experienced members of the team (Marilyn) as she goes through their daily routine. There was a lot to remember, and I have to say I was very impressed by her efficiency. It looks like while a lot of the Document Supply role is routine in nature, there are many disparate elements to the job. And this is even before I find out more about what we do with Distance Learner support! There are also a healthy number of queries which thankfully I’ve been able to take a back seat to while the more experienced members of the team answer them. Doubtlessly in time as I become embedded with the team I’ll be able to answer them myself, but right now I think that there would be a lot of very confused people out there if I took a hand. Thus all in all this has been a very eye opening experience. There was a lot to take in, quite a few things I’m going to need to think about some more and some very useful questions raised. It might be a daunting prospect taking on managing such a diverse section at a time of real change for them, but I’m really looking forward to getting stuck in! There comes a time when you know you need to move on. And following a job interview today, well that time has come for me. I’ve learned a lot and shared some valuable experiences with the team of information librarians at Leicester, and I hope in part I’ve been able to show them a thing or two. Or even three. But soon that will be behind me. But don’t despair blog readers, I’m not going far. Actually literally. I’ll be moving around 15 feet to my new post as our Document Supply and Repository Manager, bringing my experience of repositories, projects and service delivery into focus with a bigger team. It’s going to be a challenge, and frankly I’ve a lot to learn. But once again, I know my team will have something to learn from me. Even if it’s only to occasionally read the blog posts! But for now, I’ll be continuing in my current post as we agree a handover date for me to move finally to my new home.